Mold Removal AZ Offers Discount Mold Removal, Free Mold Inspection, Mold Testing, Mold Remediation, Home Repair Company, Flood Repair Service in Arizona. Count on our experts for professional Water Damage and Mold Removal services. 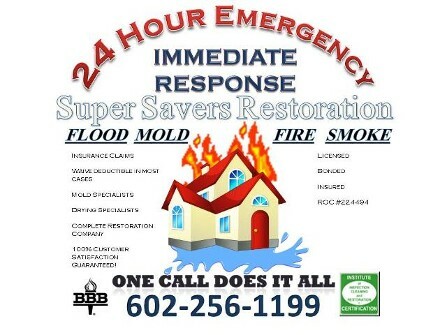 Since 1993, mold removal az has been providing superior Water Damage and Mold Removal services and water extraction services for residential and commercial properties. Our licensed and certified professionals have 21 years' combined experience to back our free mold inspections and affordable services; we started as a carpet cleaning company. Contact us today for more details on our proven mold remediation and Water Damage services. We have been in business for about 21 years doing Water Damage and Mold Remediation/ Removal services. Mold Removal AZ Offers Discount Mold Removal, Free Mold Inspection, Mold Testing, Mold Remediation 24 Hour Mold removal Company Flood Repair Service in Arizona.